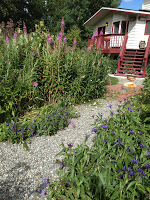 Summer 2012 in Anchorage Alaska had less sunshine more rain yet normal temperatures which tables show; however, the flowers in Camai Bed and Breakfast gardens flourished. 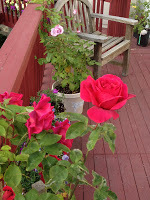 The B&B’s tea roses were especially beautiful and fragrant. We had fourteen bushes gracing our back upper deck. Guests enjoyed sitting, relaxing amid the roses while viewing the gardens below. One guest this summer stated she enjoyed their fragrance when she first stepped out of her car. 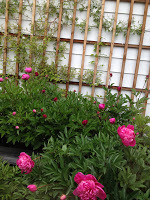 Camai’s Peony bed had its first showy peony bloom in late May. For Anchorage Alaska growing standards this is early. The remainder of the fifteen peonies bloomed through the end of June. They were abundant and exceptionally fragrant. These plants like the south side of our B&B where they have their special bed. 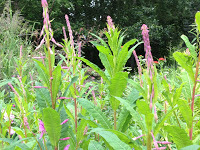 This was our first summer where the fireweed plants were tall and abundant in our perennial gardens. 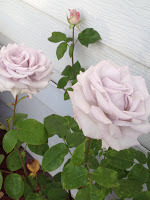 They joined our lilacs and Sitka roses. This summer we had twenty-one hanging baskets laden with blooming flowers. Of these baskets nine were fuchsias. Bell’s Nursery is their happy winter home. In May 2013 we will reclaim them when we most crave the color flowers give. In May Caroline planted the other twelve flower baskets. Everything is now either happily abiding in a green house waiting for summer 2013 or is covered with snow and also waiting to return to full glory.